One of Wikileaks’s biggest fans turned his back on the organization this morning following the arrest of Julian Assange at the Ecuadorian embassy in London. During a press spray at the White House Thursday, President Trump told reporters “I know nothing about Wikileaks” when asked if he “still loves” the site. It’s a peculiar statement given how Wikileaks was very much his “thing” when the site was targeting his opponent Hillary Clinton during the 2016 presidential campaign. Trump was vocal in his support for Wikileaks as it released hacked emails stolen from the Democratic National Committee and Clinton campaign manager John Podesta’s personal account, the latter of which were released hours after the infamous Access Hollywood tape went public. 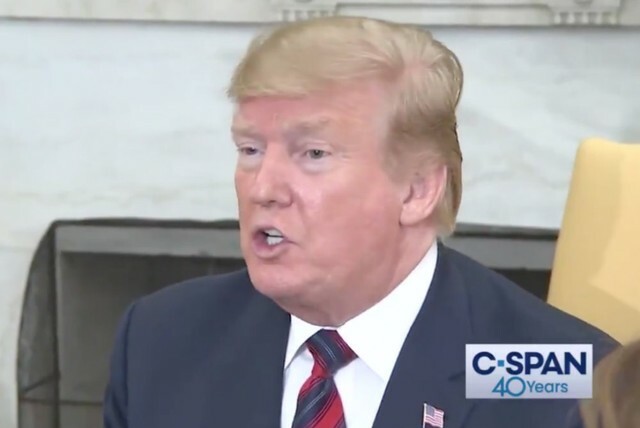 Trump often pronounced his love for the site at rallies and Vox reporter Aaron Rupar determined that Trump cited Wikileaks “about five times a day” during the final month of the campaign. According to CNBC reporter Christina Wilkie, Trump even had a poster of Assange on the wall of one of his campaign headquarters. The DOJ has charged Assange with conspiring to hack a government computer with Chelsea Manning, a charge which carries up to five years in prison.